We’ve been faithfully following East Village Leslieville‘s trajectory since it was first announced last summer, so we were over the moon when we discovered that construction is due to begin this April. East Village Leslieville initially piqued our curiosity when we learned it was planned for Gerrard Street East, a block from Greenwood Avenue. The neighbourhood is experiencing a significant revitalization and is now more desirable than ever. 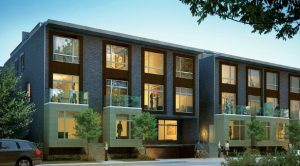 “We saw the neighbourhood as one of the last gentrifying pockets in Leslieville,” said Justin Aykler, Vice President of Aykler Developments, half of the development team behind East Village Leslieville that also includes Urban Fabric Development. And with parks, boutique shops, restaurants and transit all within walking distance, East Village Leslieville was not a tough sell. The developers have hit that sales sweet spot and plan to demolish the sales centre and commence with construction. Excited? You should be — especially if you’re condo hunting in Toronto’s East End. As Aykler noted, the development is affordable, with one bedroom suites available from the low $200s and two bedroom townhomes with rooftop terraces available from the mid-$400s. 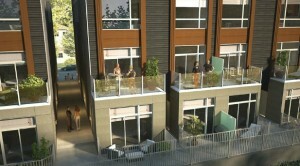 The developers also are offering are limited time $10,000 discount on closing for the townhomes. The offer ends when the sales centre is demolished and construction begins in April, so hop on it soon! making it an all-season attraction. The City of Toronto has nearly completed a large cover over the hockey rink at the park, allowing it to host a weekly farmers market in the spring and summer. To the south of East Village Leslieville is Ashbridge’s Bay Park, a destination park that boasts public boating launch ramps, scenic bike trails located on the Martin Goodman Trail and a must-see Canada Day fireworks display. We’ll have more buzz on East Village Leslieville coming up soon, so keep an eye on BuzzBuzzHome News and the job site on Gerrard, near Greenwood Avenue to stay in the loop on all the action. For more info email info@eastvillageleslieville.com or call 416 465 4343.